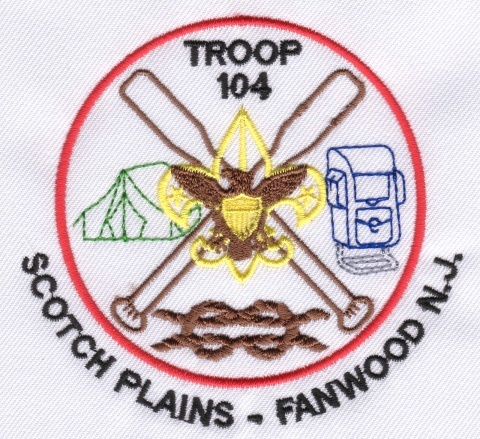 Welcome to BSA Troop 104's website! Meetings are held at All Saints' Episcopal Church, 559 Park Avenue, Scotch Plains, NJ. We meet every Monday night from 7:30 PM to 9 PM whenever school is in session. This site is maintained by volunteer Scouts. Although it contains useful information on local Scouting programs, it is not an official BSA web site. The information provided here has not been approved by the Patriots' Path Council or the Boy Scouts of America. Note: you will need Flash installed to view our photo album. Generally we do not have a Troop meeting when there is no school. However, in this case, we believe that the snow will be finished for at least 12 hours, so we have elected to have an optional meeting. By optional, we mean that the leaders will be there, and any scouts whose parents feel that they can safely get the boys to and from the meeting should bring them. Many scouts wish to have scoutmaster conferences and Boards of Review for the upcoming Court of Honor happening on 3/18 so we'd like to get as many done on 3/4 as we can. There will be no attendance taken, and no repercussions for missing the meeting -- safety comes first. But we'd love to see you if you can safely attend. The 2018 Troop registration form is now available in the Files Section, under Registration Forms -> 2018. All scouts must submit a 2018 registration form along with their payment. Summer Camp Forms Now Available! Summer Camp 2017 forms are now available in the FIles section of the website! A new order of winter hats has just arrived and will be sold at the meeting of 1/23/17 for $10 apiece.